Founded in 1997, East Clare Walking Club has members from counties Galway, Clare, Limerick and Tipperary. 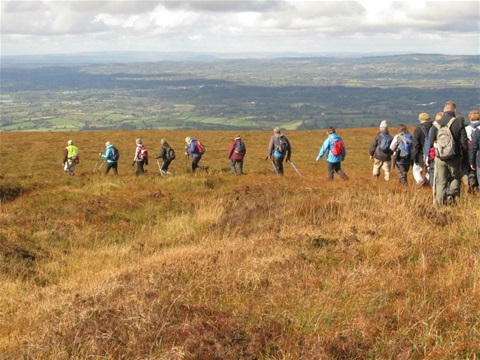 A walk is held every second Sunday throughout most of the year, many routes incorporating various stages of the East Clare Way as well as further afield in the Burren, Galtees, Slieve Felim, Connemara, Slieve Bloom, Ballyhoura and the occasional coastal, lakeside or riverside walk. Walks are for the enjoyment of the countryside rather than for proving fitness, so although some of the routes can be challenging we aim to set a pace to suit all those walking. Each route is given a "star" rating, easy, moderate or tough and more information can be obtained from the contact person detailed on the current walks' schedule. Waterproof clothing and stout boots are needed for most routes. Bring a packed lunch as walks start at 11 a.m.
Two or three times a year East Clare Walking Club organises an away outing staying in self-catering, hostel, guesthouse or economy hotel accommodation. These have proved very successful and good value. Past visits have included counties Kerry, Galway, Mayo, Down, Cork, Waterford, Tipperary, Offaly, Sligo and Kilkenny as well as taking in peaks such as Carrauntoohil, Galtymore, Brandon, Nephin,Benbulben, Slieve Donard and Mweelrea. Longer stays have been to Belgium/Ardennes, Italy/Appenines, France/Pyrenees, Spain/Sierra Nevada, Spain/Camino and Spain/Tenerife. Fees collected go towards cost of annual insurance,website, postage and stationery. You can join the club either as a visitor or full member on any of the walks. New members or visitors are always welcome.